The Avenue of Honour, Macedon which comprises Honour Avenue and 154 oak trees, predominantly Pin Oak (Quercus palustris). 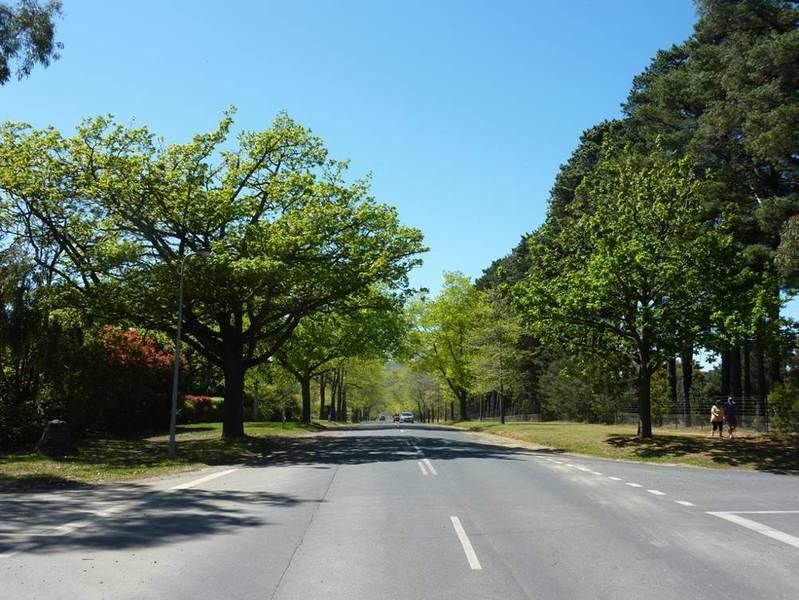 The oaks line both sides of Honour Avenue between Bent Street and Mt Macedon Road, with one English oak (Quercus robur) at the ends of each row. There are two associated memorial cairns. Since the early 1900s, commemorative avenues of trees have been planted in Australia and internationally to honour those who have served in wartime. During and after World War I avenues of honour were particularly popular in Victoria with some 218 memorial avenues planted throughout the state. Victoria has the largest number of avenues of honour of any state or territory in Australia. The Avenue of Honour, Macedon was officially opened on 10 August 1918 by the Premier of Victoria, Harry Lawson, at a ceremony attended by some 700 people. 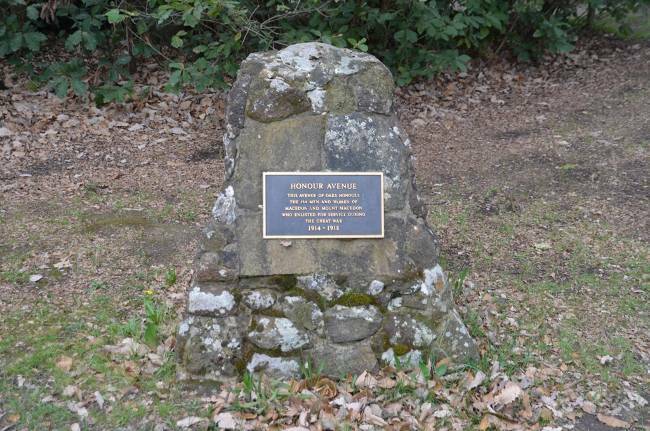 The site in Mile Road, Macedon, located between the railway station and Mt Macedon Road and travelled by many visitors, was selected to establish an avenue of honour to commemorate those from the Macedon and Upper Macedon district who had enlisted to serve in World War I. The decision to plant this memorial avenue was made at a public meeting in May 1918 and in the following month a list of those entitled to be represented was established. Voluntary workers spent three months preparing the selected site and all but four of 154 trees were planted prior to the official opening of the avenue. At this ceremony the Premier planted a tree commemorating Lieutenant Arthur Grumont, who was the first to enlist from the district on 21 August 1914, and trees were planted for three others by the President of the Gisborne Shire Council, Rev D G Baillie, and the Federal and State members for the district, Mr Lister MHR and the Hon A Robertson MLA. Certificates of service were presented to returned soldiers by the Premier. Trees have been replaced over time, particularly after fire damaged a number of trees in 1983 and after the establishment of a replanting programme by the Gisborne Shire from 1994. Memorial cairns with plaques were placed at both ends of the avenue in 1994. 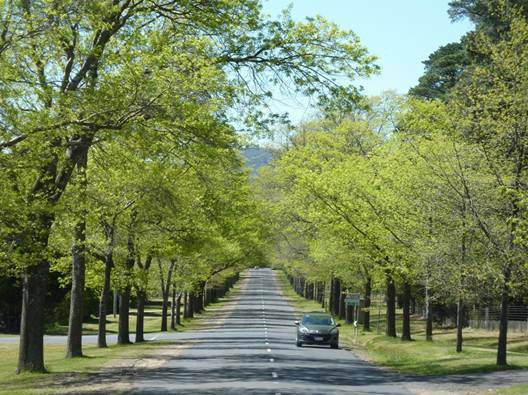 The Avenue of Honour, Macedon is an avenue of 154 oak trees, predominantly Pin Oak (Quercus palustris), with one English oak (Quercus robur) at both ends of each row. Planted on Honour Avenue, the avenue is approximately one kilometre in length and runs between the cemetery at Bent Street and Mt Macedon Road. Rubble stone cairns are located at both ends, with the larger at the eastern end listing all those represented in the avenue and their associated tree numbers. It appears that individual name plaques were not placed on individual trees. The Avenue of Honour, Macedon is socially significant at a local level for its relationship with the community as a memorial to those who served in World War I and for its continuing commemorative importance. It remains as an indication of the involvement of Victoria's small communities in commemorating the sacrifices of their volunteers, along with the loss and sorrow experienced in small rural areas such as the Macedon district. As Executive Director for the purpose of the Heritage Act 1995, I give notice under section 46 that the Victorian Heritage Register is amended by including Heritage Register Number H2344 in the category described as Heritage Place. All of the place shown hatched on Diagram 2344 encompassing all of the road reserve of Honour Avenue Macedon between Mount Macedon Road and Bent Street plus part of the road reserve of Mount Macedon Road within a 12 metre radius of the eastern memorial cairn. Since the early 1900s, commemorative avenues of trees have been planted in Australia and internationally to honour those who have served in wartime. 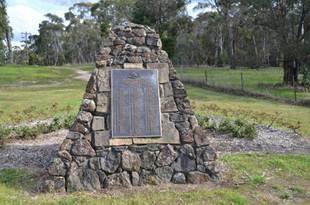 Becoming commonly known as 'avenues of honour', they were first planted in Victoria at Horsham and Apsley to the west of the state in 1902, to commemorate soldiers who fought in the Boer War. During and after World War I, avenues of honour were particularly popular in Victoria with some 218 memorial avenues planted throughout the state. Victoria has the largest number of avenues of honour of any state or territory in Australia. From the 1850s, there was a civic movement in Australia to create parks, gardens and tree-lined streets in order to beautify and improve the amenity of towns. This was strengthened with the introduction of Arbour Day in Australia in 1889, a day when coordinated tree plantings took place in local communities. These days were very popular in rural communities and local school children were often involved in the plantings. Tree plantings of a commemorative nature also took place in the nineteenth and early twentieth centuries. Trees were often planted in public spaces by both local and visiting dignitaries at official ceremonies to commemorate special occasions such as royal events and the opening of new buildings. From the mid-nineteenth century, royal tours to Australia often included the planting of commemorative trees. World War I had an immense impact on Australia, more than any other event since British settlement, with over 200,000 Australians killed or injured in just four years. This tragedy pervaded all communities and resulted in commemoration in a number of different ways. This included honour boards, war memorial statues and monuments and the planting of trees to form an avenue of honour, with each tree planted to commemorate a person who served, no matter their rank. Considered a symbol of hope for the future, trees had the additional benefit of beautifying towns and the surrounding countryside, particularly in Australia where the landscape was regarded as being largely undeveloped. The majority of avenues of honour were planted along major roads where they received maximum public exposure and their distinctive form became important aesthetic elements along the main roads of small towns in country Victoria. A range of different tree species were used, more commonly exotic species such as elms, oaks and cypress, and occasionally native species such as eucalypts. Unlike most types of memorials, the planting of a commemorative avenue of trees enabled entire communities to become involved in commemorating those involved in the war. This was encouraged by an official initiative from the State Recruiting Committee of Victoria, which wrote to all municipalities and shires in 1917 recommending that an assurance should be given to every intending recruit that 'his name will be memorialised in an Avenue of Honour'. As a result Victoria became the heartland of such avenues as they were promoted early and strongly, and a total of some 218 avenues were planted to commemorate World War I in Victoria. The first avenue of honour identified in Victoria to commemorate World War I was planted at Eurack (VHR H2101) in the Western District of the state in May 1916. This was a single row of twenty Dutch elms with white crosses containing name plaques placed at the foot of each tree. The largest avenue was planted at Ballarat (VHR H2089) from 1917 to 1919. This avenue comprised over 3000 trees of various species which were planted to commemorate the soldiers and some nurses from the district who served their country. This avenue appeared to influence other communities in the surrounding districts to plant similar avenues. The avenues were symbols of a national cause of commemoration but also allowed individual communities to express their local identity and independence. Together with honour boards, this form of memorial allowed communities to create immediate memorials and avenues preceded the erection of monuments and statues, often by a significant number of years. A high level of community participation was generally required for both raising funds and planting the trees. Trees were often donated and planted by voluntary labour and as part of a local civic ceremony. The local council and progress association were often the instigators of the projects and many meetings included discussions to determine the location of the avenue, the tree type, the form of tree guard and the provision, type and arrangement of name plaques. Local councils often contributed financially to the avenue and frequently the community was also asked to contribute. Once the location was decided, numerous working bees were held to prepare for the final planting of the trees. The local Red Cross societies were involved in providing refreshments for these occasions. Commemoration after World War II was more commonly utilitarian, with the building of memorial halls and swimming pools and the planting of gardens in Victoria. Avenues of Honour declined in popularity however some existing avenues were extended after the war and a small number of avenues were planted. The latter included the Calder Woodburn Memorial Avenue (VHR H1975) which was planted along the Goulburn Valley Highway between 1945 and 1949 by Mr J L F Woodburn as a memorial to his son Calder and other local servicemen who did not return from the war. It comprised a total planting of 2,457 Australian native trees. A very small number of commemorative avenues were planted in association with later wars such as the Vietnam War. In total, over 300 avenues of honour were planted in Victoria to commemorate service personnel in the twentieth century. The majority of these, approximately 218, were planted as World War I memorials between 1917 and 1921. This compares with significantly fewer avenues in other Australian states, with well less than this number planted in the other states combined. Minutes of a public meeting held at the Macedon Working Men's Hall on 1 May 1918 record that Macedon and Upper Macedon combined to establish an avenue to honour those who enlisted from the district in World War I. The committee comprised members of the Working Men's Club and residents of Upper Macedon. It was decided that the site for the avenue would be Mile Road in Macedon, from the cemetery towards the property Dreamthorpe, owned by Judge Henry Hodges, in Mt Macedon Road. Located between the Macedon Railway Station and the Mt Macedon Road, this selected route was travelled by a great number of visitors and residents. There was considerable debate over the choice of the most appropriate tree species for the Avenue of Honour. The proximity of the Macedon area to Melbourne made it a popular summer retreat for wealthy businessmen from the late nineteenth century onwards, and by 1918 many extensive gardens had been established with displays of exotic tree species. These displays would have influenced the selection of the pin oak (Quercus palustris) for the Avenue of Honour, with its spectacular autumn colour, although the species was recorded at the time of planting as 'the handsome scarlet oak variety'. 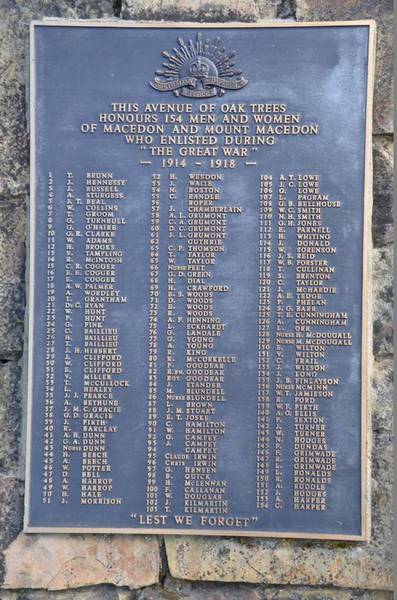 A list of those from the district who were entitled to have a tree planted in the planned Avenue of Honour at Macedon was included in the Woodend Star on 22 June 1918, and a request was made for any additional names to be forwarded to the organisers. 154 servicemen and women were allocated individual trees by ballot and these were listed in the Woodend Star on 17 August 1918 and on a board displayed at the official opening. The Avenue of Honour was completed and officially opened on 10 August 1918 after a period of three months preparatory work, generally undertaken by community volunteers. After vegetation was removed from the selected site, volunteers attended regular working bees to dig holes 6 feet in diameter, remove and replace soil and lay drainage pipes. Triangular sawn timber tree guards were erected and the majority of trees were planted before the official ceremony, with four retained for planting on the official day. Community donations for establishment of the avenue totalled £ 100. The opening ceremony of the Macedon memorial avenue was reported in detail in the Argus, Australasian and the Woodend Star. An estimated 700 people attended the ceremony and a list of well known attendees was included in the Australasian on 17 August 1918. The President of the Gisborne Shire Council, Rev D G Baillie, the Premier of the State, Mr Lawson and the Federal and State members, Mr Lister MHR and the Hon A Robertson MLA were present and they planted the four remaining trees. Mr Lawson planted a tree commemorating Lieutenant Arthur Grumont, who was the first to enlist from the district on 21 August 1914; Mr Lister planted a tree for Sergeant George Green who was the first from the district to make the supreme sacrifice when he fell at the Gallipoli landing; Hon A Robertson planted a tree for Carl Cogger, the second from the district to enlist and Mr Baillie planted a tree for James Reid, who had close associations with the district. The Returned Soldiers' Band attended the ceremony, certificates of service were presented to returned soldiers by the Premier and refreshments were served from a rustic structure formed from gum sapling supports and decorated with wattle blossom. The Woodend Star, 17 August 1918, reported that a 'striking display of bunting' and a 'fine display of emblems from the Empire and her Allies' decorated the town and the avenue. In December 1918 it was reported that the trees in the avenue were in full leaf, although a few trees had died and were to be replaced the following season. It was also reported at this time that it was intended to extend the avenue along Mile Road, presumably to the west, however this did not eventuate. The Macedon Avenue Honour Committee continued to meet on irregular occasions until the care of the avenue was handed to the Shire Council on 1 November 1933. Some trees in the Avenue of Honour were damaged by fire during the Ash Wednesday bushfires in 1983. A number of trees were subsequently replaced, however further renewal was required ten years later and a tree replacement programme was established by the Gisborne Shire Council in 1994, using acorns produced by trees in the avenue. The erection of memorial cairns in association with the Avenue of Honour was discussed for a number of years however they were considered too expensive. Cairns were finally constructed at both ends of the avenue in 1994. A large cairn was placed at the east end containing a plaque listing all those represented in the Avenue of Honour and their associated tree locations, and a smaller cairn with plaque was placed at the west end. This Avenue of Honour was planted in 1918 by the local community for the Macedon district with each tree, predominantly pin oak, representing a local enlisted serviceman or woman. It is one of more than 200 World War I avenues planted in Victoria. All works should be informed by Conservation Management Plans prepared for the place.
. Removal of dead or dangerous trees and emergency tree works to maintain public safety and to protect buildings and structures providing the Executive Director is notified within 21 days of the removal or works occurring.
. Management and maintenance of trees, including formative and remedial pruning, removal of deadwood, pest and disease control, cabling, mowing, weed control and mulching.
. In the event of loss or removal of trees, replanting with Pin Oak (Quercus palustris), or English Oak (Quercus robur) at the end of the rows.
. Removal of tree seedlings and suckers but excluding herbicide use.
. Removal of plants listed as prohibited and controlled weeds in the Catchment and Land Protection Act 1994.
. Repair, maintenance, replacement and removal of existing structures and hard landscape elements such as driveways and crossovers, stone and concrete edging, fences and gates.
. All road and pavement works to Honour Avenue and any intersecting road within the extent of registration from shoulder to shoulder.
. Traffic management and safety works including removal and installation of traffic and directional signs, reflector posts, and line marking.
. Minor repair, maintenance and conservation by a qualified conservator to memorial monuments and name plaques in a manner which preserves the cultural heritage significance of the place. 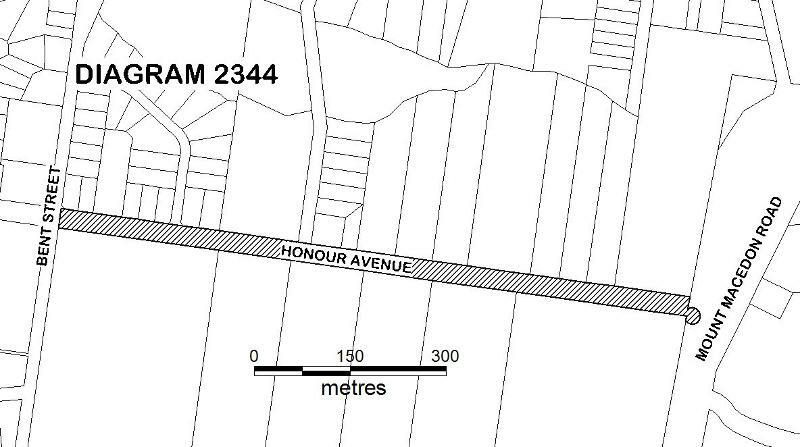 The extent of registration of the Avenue of Honour, Macedon on the Victorian Heritage Register affects the whole place shown on Diagram 2344 including the land, roads, trees, memorials and plaques. Under the Heritage Act 1995 a person must not remove or demolish, damage or despoil, develop or alter or excavate, relocate or disturb the position of any part of a registered place or object without approval. It is acknowledged, however, that alterations and other works may be required to keep places and objects in good repair and adapt them for use into the future. 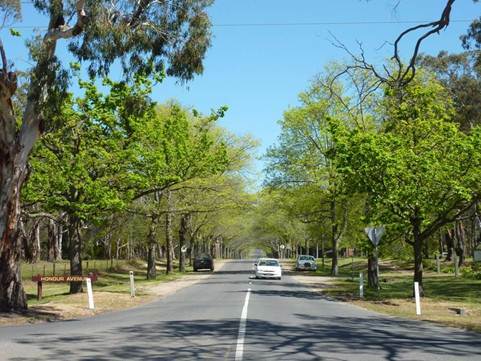 The Macedon Ranges Shire Council is encouraged to prepare a Tree Management Plan. 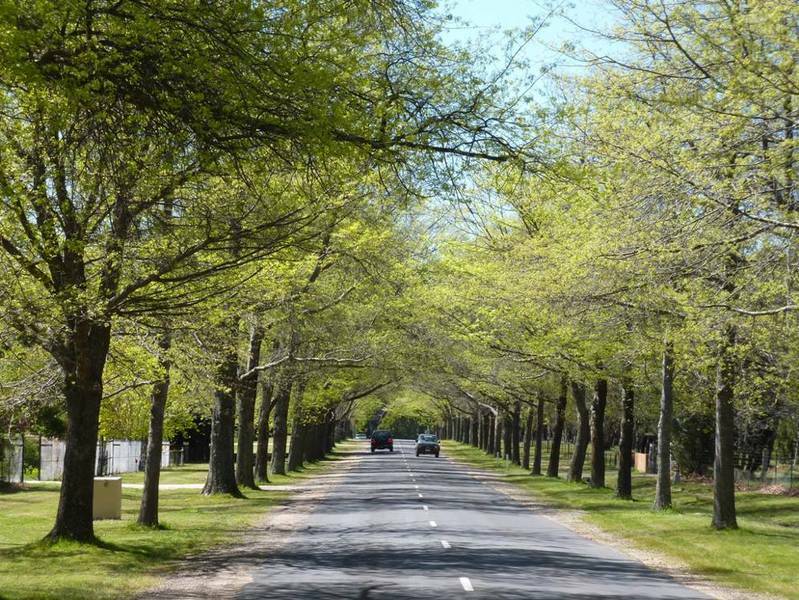 The cultural heritage significance of the Avenue of Honour, Macedon is as an intact and fine commemorative planting that symbolises the response of a rural community to World War I. Each tree is dedicated to an individual soldier and contributes to the significance of the Avenue of Honour as a whole. It is significant as an extensive and uniform avenue of pin oak and as an impressive landscape feature. All works should ensure the protection of the trees and the aesthetic value of the avenue street plantings. The following works and activities within the road reserve will require the approval of the Executive Director, Heritage Victoria. An arborist's report is likely to be required to determine the impact of the works on the trees.
. Works associated with water, gas, power, sewer or similar services. Any changes to the memorial cairns, other than minor repairs, maintenance and conservation by a qualified conservator, will require the approval of the Executive Director of Heritage Victoria. Parking within the root zone of the trees should be discouraged.